Too often words disappear like shadows in the dark. There and then gone, there and then forgotten. Day Of Silence 2014, CHALLENGE ACCEPTED; we took the challenge to break the silence with silence! Every year, every month, every week, every day,every hour, every minute and every second someone – somewhere is being made a victim. Every time we turn a blind eye to bullying and discrimination we are being made a part of that cycle of bullying and oppression. 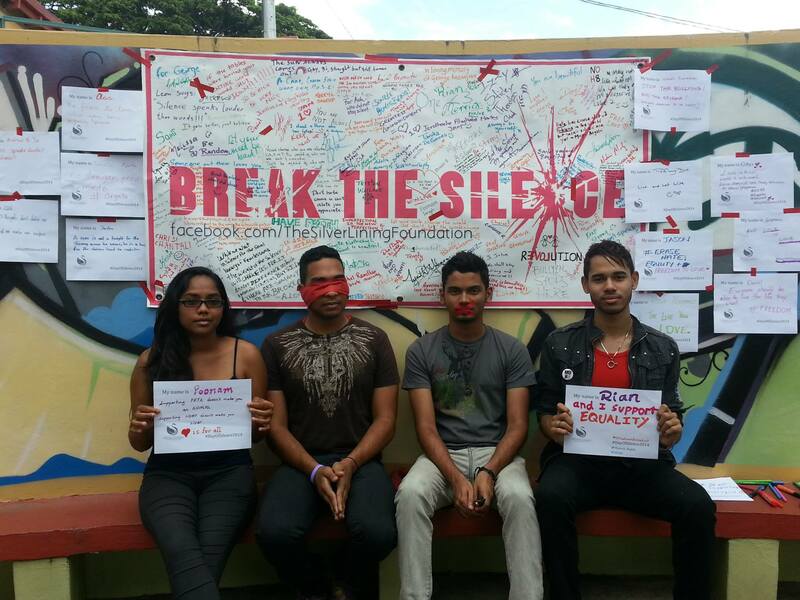 This year the Silver Lining Foundation, along with our many supporters at UWI continued breaking the silence on homophobic bullying. This year, instead of just taking vows of silence, we demonstrated how turning a blind eye to discrimination can have harmful effects. If you’ve ever felt like you’re telling your problems to someone who knows but doesn’t understand your problem, then you could understand why we were telling our stories to persons who were blindfolded at the whisper wall. This year we sat on the whisper wall, unable to see and invited brave supporters tell us about their lives, fears,insecurities, labels, the times they were bullied, persecuted or to even whisper words of inspiration. Some took the vow of silence, took to Facebook and Twitter- posting supportive selfies of inspiration or blindfolded themselves – allowing others to talk to them in complete anonymity; to learn what it was like to know someones story but not who they are, and learn what it was like to truly be silenced. These brave messengers of hope accepted the challenge; stood up and spoke out for those who were silenced and continue to break the silence on bullying and discrimination!